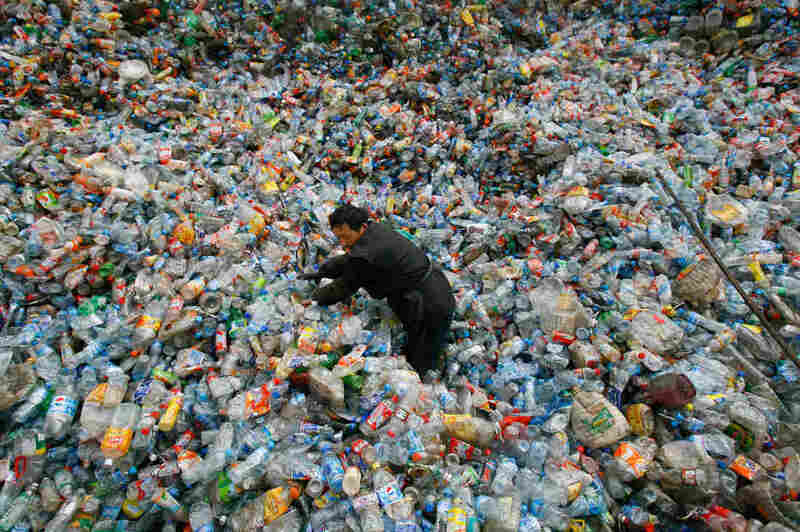 Now That China Has Refused To Recycle The West's Plastics, Where Will They Go? : Goats and Soda So where will all those bottles and bags end up? A new study looks at what's happening. A worker sorts plastic bottles at a recycling center in China. According to the authors of a new study, it's piling up. "We have heard reports of waste accumulating in these places that depend on China," says Amy Brooks, a doctoral student of engineering at the University of Georgia and the lead author of the study published in Scientific Advances last week. She says some of it is ending up in landfills, being incinerated or sent to other countries "that lack the infrastructure to properly manage it." By 2030, an estimated 111 million metric tons of plastic waste will be displaced because of China's new law, the study estimates. This is equal to nearly half of all plastic waste that has been imported globally since 1988. Rapid expansion of disposable plastics in the 1990s — and single-use containers — drove imports up rapidly. Yearly global imports grew 723 percent, to around 15 million megatons, from 1993 to 2016. For developed nations like the United States, it can be more economical to push plastics out of the country rather than recycling them, says Jenna Jambeck, an associate professor of engineering at the University of Georgia and another of the study's authors. The U.S., Japan and Germany are all at the top of the list when it comes to exporting their used plastic. In the U.S. alone, some 26.7 million tons were sent out of the country between 1988 and 2016. Hong Kong is the biggest exporter of plastic waste, at 56.1 million tons. But it has acted as an entry point to China — having imported 64.5 million tons from 1988 to 2016 from places like the U.S. (which sent more than 372,000 metric tons there in 2017) and then having sent most of that on to China. Other nations can buy and recycle these plastics and manufacture more goods for sale or export, as China did, making it profitable for them as well, the study notes. Industry publication Waste Dive reports that the U.S. sent 137,044 metric tons to Vietnam in 2017, up from 66,747 in 2016. But nations like Malaysia, Thailand or Vietnam, which have picked up some of what China is leaving behind, don't have as well-developed waste management systems. Jambeck says Vietnam has already reached a cap on how much waste it can handle: The country has announced it will not accept any more imports of plastic scraps until October. "Not one country alone has the capacity to take what China was taking," Jambeck says. "What we need to do is take responsibility in making sure that waste is managed in a way that is responsible, wherever that waste goes — responsible meaning both environmentally and socially." Marian Chertow, the director of the program on solid waste policy at Yale who was not involved in the study, says these new findings are useful because it confirms what experts thought they knew — nearly half of plastic waste exports have ended up being recycled in China. "There's a tremendous shift in the market when China won't take half of these plastics. I really think that this export mindset that has developed in the U.S. is one that has to change," she says.